To me, the continuing LNG fantasy initiative qualifies as a Dead Pony Solution. It assumes there are only positive arguments to go forward regardless! This belligerent belief is presented by people who cannot tolerate facts that contradict their conviction. It’s a position that media refuses to doubt publicly with the same disdain they express privately. It is the latest Titanic crossing. To hell with the risks, we’re in a hurry. It is required when political and economic agendas stand at extreme variance with reality. For the Libs to insist that further investment will certainly yield tremendous benefits doesn’t require familiarity with freely available cost, distribution and geographic disadvantage facts – it requires faith… faith that political semantics and stubborn hope can somehow can trump reality. The taxpaying public must forget what isn’t feasible and go forward, pretending that by sheer wil, nothing BC Libs wish to do is impossible, including trying to sell LNG to Asia at prices Asians will laugh at. How did this parade of clown-logic occur? Hypothesis: Looking for an energy winner, our Libs chance upon a dying pony. Being vaguely aware there are miraculous performance enhancing drugs, they decide to inject massive doses of costly stimulant into the beast. 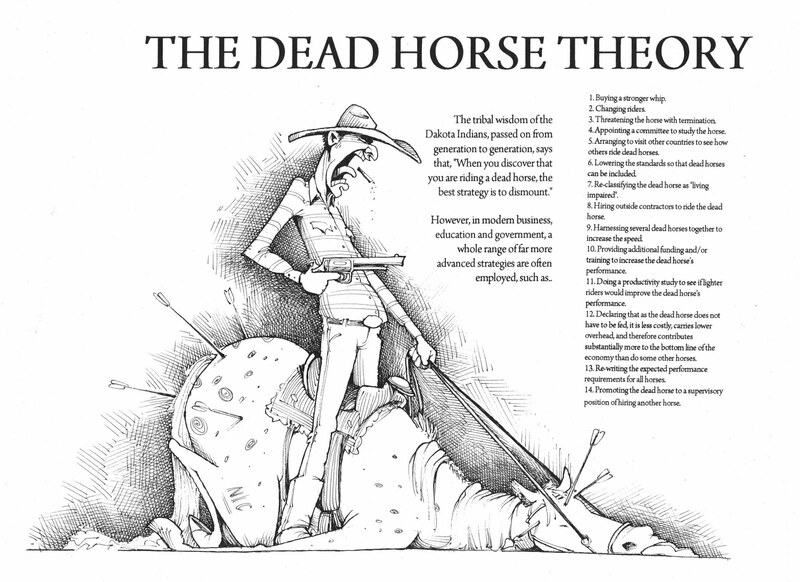 Declaring that as the dead horse does not have to be fed, it is less costly, carries lower overhead and therefore contributes substantially more to the bottom line of the economy than do some other horses. Rewriting the expected performance requirements for all horses. .. sticking a horn on the head of a dead horse turns it into a unicorn, n'est ce pas ? I think BC is being ridden – whipped.. by a political creature adhering to her very own 'press on regardless' mantra.. Who bought & sold her remains the question.. but the chronic echo of Stephen Harper at the federal level may be a huge part of the answer.. Who profits? Who benefits from applied disregard & destructive policies regarding fundamental protection of waters, land and air? I think part of it is that the BC Govt needs there to be GDP growth, since they are looking at the debt/GDP ratio. They need to see 2% or greater GDP growth in BC, every year. Because total provincial debt is growing by $billions every year. The federal govt is the same. The BC Govt is desperate, and they see LNG as a driver of GDP growth, even though it's obviously a dead horse. This is brilliant — and good fun! While we watch the faux resuscitation of the dead horse, Christy saddles up a Trojan horse named Site C and vows to ride it past the point of no return before it’s opened. Tune in for the next episode when four horsemen of the apocalyptic type ride out of it. The Liberal's know it's dead, they are just using it to siphon off taxpayers money on projects and scams. The LNG is, has, and was just a ruse for Clark to dupe the gullible voters. Clark and her gang will leave office when there is nothing left for them to fleece and we are on the verge of bankruptcy. I truly believe that is their plan. Think how much further all their ill gotten gains will go when BC is bankrupt and they a cash rich. That is the final move! They sure as hell aren't in it to improve anything for the public. Just name one thing for the better….anybody? 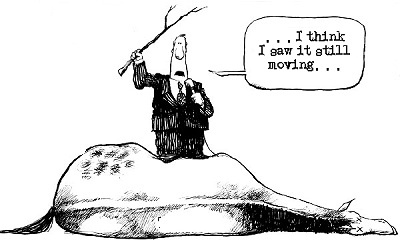 After the fleecing has been done and should the NDP take over, ( unless the less then engaged voters remain so and heaven forbid the scammers are voted in again) within a month or so, the usual suspects will come out of the woodwork blaming the new Govt. for every disaster they can dream up. Look at present day Alberta for the model of right wing fiscal management and accompanying hypocrisy. Dead horse? More like a dead parrot. Perhaps that's the reason the NDP don't make a greater effort to take over. Who in their right mind would want to be saddled with the mess the LIeberals have created? John, are you saying $170 billion total BC debt and contractual obligations, rising hydro rates, not to mention a scary unsustainable real estate bubble in Vancouver is a mess? Very true, John's Aghast. Is power in such a “corrupt political environment” actually worth the time and effort? Think of the “blocks” and encumbrances that would be placed in a “new” governments way to prevent the investigation into a previous governments “indiscretions”? Many of Norm's readers have outlined those “vast number of indiscretions”, along with other bloggers. The “scorched earth concept” in politics, would most likely be vigorously applied by the BC Liebrals, knowing that some of their skeletons in the closet, would not want to see the light of day. The “hypocrisy” of course would be the BC Liberal support turning on the newly elected non “liberal” government for their “current political mess”, much the same as the Alberta NDP are experiencing. The irony being, the Liberals created the mess in the first place, the same as the Alberta conservatives. Sadly this is the way the “game” is played. Solutions…acceptance of the inevitable backlash, from a losing party and large group of influential supporters and cronies who benefitted in the extreme, from the exiting parties corrupt practices. Then, build the new government, from there. U.S. exports will add to a wave of supply coming from Australian projects at a time when demand falters in major consuming countries and prices have plummeted in line with oil. Companies including Chevron Corp, Royal Dutch Shell and Exxon Mobil Corp have invested some $180 billion in seven Australian LNG export plants ramping up production from 2015 to 2017, making the country the top exporter of the fuel ahead of Qatar. The investment in British Columbia these last few years has largely been spent on lobbying, rewarding politicians and conducting public relations. The industry has guarantees from the BC Government that it will only pay a nominal amount for gas, if anything, and it will be given electricity for liquefaction at prices far below BC Hydro's marginal cost of power. Producers don't have to guarantee that labour, machinery and supplies will be Canadian origin. Despite being offered unprecedented subsidies and rewards, the industry believes that is insufficient. Like operators of professional sport franchises, the fossil fuel industry plays one location off against another. Projects in BC are kept alive as a favour to the present government and because the prospects of Canadian LNG are useful in extracting benefits in competing lands that are closer to markets. If producers are expected to pay little or nothing for the resource in Canada and to use low cost foreign labour and transport, countries like Australia will be told they cannot expect to profit from an LNG industry in their own land. Oh no. That should sort itself out with the help of the LNG Prosperity Fund. Its the 'Balanced Budget' that I have trouble with. Like, once I account for food, shelter, transportation and taxes is it okay to put my daughter on the street to raise the shortfall in my budget like Chrispy does with ICBC? And get my son to pawn his hockey gear and bike like she does with BC Hydro? Do the BC Ferries still contribute to 'balance' the budget? If we could only sell our blood (like they do in the States) we could probably even create a 'Prosperity Fund'. Yes, you could call it a “mess”. Les Leyne unleashes on Gordon Wilson and the LNG Buy BC site, which cost $850,000. LNG jobs are supposed to be listed at the site — but there's not one! Include Wilson's $150K per year x 6 years and you have $1.75 million producing sweet nothing. We can't survive with that kind of sound fiscal management. Does anyone know what the Ministry of Natural Gas would spend $2.58 billion on?